In cooperation with the Arab Network for Literacy and Adult Education and the Association of Eve Future (Hawaa El Mostakbal), the Arab Council for Childhood and Development (ACCD) held an Arab ceremony on the occasion of Arab Literacy Day under the slogan "Together for Children Quality Education to Confront Adults' Literacy", on the 10th of January 2017, at ACCD's headquarters. 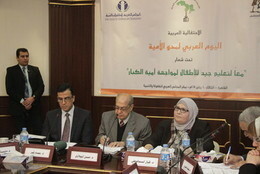 Seventy participants attended this event, representing a number of the executive, legislative and civil institutions concerned with literacy and education, including the General Authority for Literacy and Adult Education, the National Council for Childhood and Motherhood, the Ministry of Social Solidarity, the National Center for Educational Research and Development, and the Center for Adult Education at Ain Shams University, as well as representatives of regional and international organizations; such as UNESCO, UNICEF and the International Council of Adult Education, in addition to numerous civil society organizations, experts, specialists and researchers in various fields of development. The participants referred to the commitment of the Arab countries and the willingness of their leaders to adopt the slogan of the Sustainable Development Goals (SDGs) "no one will be left behind". The SDGs, adopted in September 2015, seek to eradicate poverty and provide opportunities of quality education for all, in order to have citizens free of illiteracy, with diverse abilities and skills and who can deal with the age of knowledge; in what is deemed a developmental action that aims at confronting the challenges facing the Arab countries in the context of a changing world. Further, the participants emphasized the importance of focusing on basic education; being the cornerstone in building the individual, with a view to eliminate illiteracy and diminish its roots. They also called for considering basic education a priority that requires national attention for a better future that provides opportunities to develop creative individuals with skills of proper thinking, criticism and creativity, in addition to the ability to deal with life and confront its various challenges. - Calling for the adoption of the closing statement and all the recommendations of the Conference of Incheon in Korea. - The necessity of dealing with SDGs as an indivisible unit, especially the four goals related to human development; namely the first, third, fourth and fifth goals. - Advocating for increasing the financial allocations for education and health in the budgets adopted by the Arab countries. - Calling for adopting the concepts of ACCD's Upbringing Model that promote education for hope and humanizing education. - Spreading awareness and mobilizing communities to achieve the SGDs, especially in terms of education. - Developing proper mechanisms of implementation to institutionalize partnerships, as well as social mobilization with a view to integrate the efforts and maximize the results to achieve sustainable development. - Promoting building a strong civil society and creating a good and supportive environment for its developmental work. This is done through encouraging civil initiatives in cooperation with the private sector throughout the concept of social responsibility and supporting active partnerships. - The necessity of linking the plans and programs relevant to confronting illiteracy and eliminating school dropout, as well as developing educational curricula that would help in overcoming illiteracy. - Building effective partnerships among governmental institutions and civil society organizations, in an important step to ensure achieving the SDGs. - Drafting plans and programs that ensure quality education, appropriate in emergency situations; such as conflicts, displacement and asylum cases. - Investing technology and considering it an essential part in the processes of education and learning. - Working on the development of programs that aim to promote the opportunities of a better life for all individuals, especially the disadvantaged and marginalized (women and children), through enabling them socially, economically and culturally. - Forming a committee to follow up the recommendations of this statement issued by ACCD and the Secretariat of the Arab Network for Literacy and Adult Education. - Building and applying integrated developmental models that target education, learning, and cultural enlightenment, in local and Arab communities. - Documentation and scientific monitoring of the best experiences, practices and Arab applications in literacy and development. - Advocating holding regular meetings that aim to manage and develop partnerships, with a view to organize the exerted efforts and enhance joint actions.